Hoover or Rooseveltâ€”which will be our next president? Millions of voters will cast their ballots in November on a new ingenious machine which will baffle crooked voters and minimize the delay in learning who has been elected. 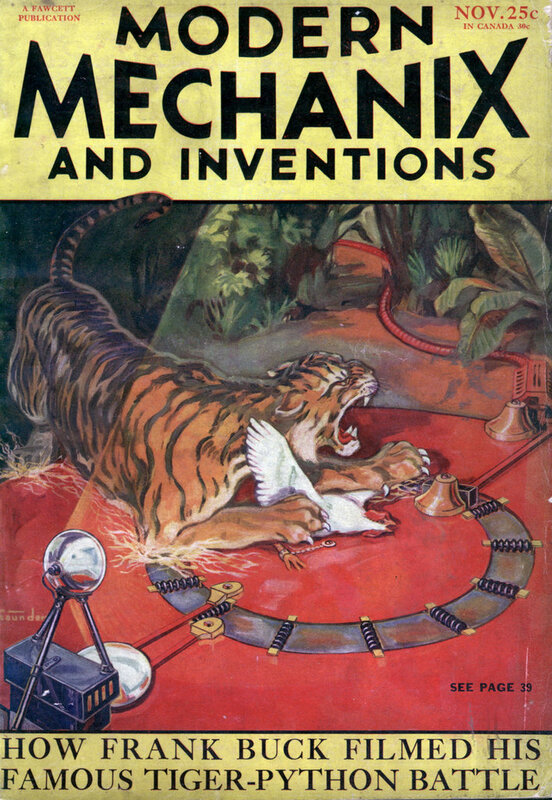 Here is told the fascinating story of this machine and of its forebears devised by inventors of ancient times. TRULY, magic-working mechanical wizardry shall select the next president of the United States, as millions of voters march to the election booth in November to cast their ballots. “50,000,000 Votes for President!” is the popular slogan. Thanks to the genius of the engineer, who has perfected voting machinery of marvelous accuracy and precision, it is now possible to tabulate the greatest popular vote in history, announce the result and flash the news to the remotest hamlet in less than sixty minutes after the polls close. For countless centuries man sought to devise some method of quickly and accurately counting the votes of the people. During this long struggle to cause the voice of the people to be heard, many methods have been used in votingâ€”by acclamation, by markings on paper or leaves, and by stones and pebbles, until our own day, when the perfected voting machine has been adopted, by the large centers of population. Thomas A. Edison was a pioneer in this field. On June 1, 1869, the first patent for which he had ever applied and for his first invention, was granted. This pioneer of voting machines, Edison perfected with the hope that it might be used in Congress, permitting several hundred members to cast a ballot in not to exceed two minutes. But it was rejected, and was Edison’s only noncommercial and unsuccessful invention, though the idea blazed the way to the ultimate perfection of the present voting machine. In 1896 Daniel Davis and Etna H. Davis, of Elmira, New York, patented a voting machine which is shown in an accompanying drawing. The first voting machine built and actually used in an election, however, was the Myers machine, invented by Jacob Myers, and was used at Lockport, New York. So successful became this machine that it was widely adopted, to be improved upon by S. E. Davis and A. J. Gillespie, and thus blossomed into the present day voting machine. 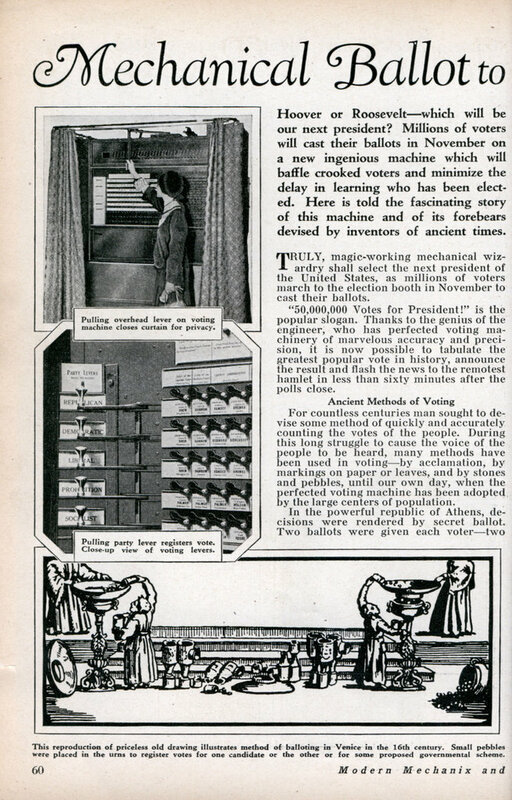 This machine, seen on the first two pages of this article, has an upright keyboard, on which are rows of keys, each of which represents a party candidate, arranged in horizontal lines across the face of the machine. At the left of each party row is a lever which, pulled down, may be used to vote a “Straight Ticket.” Or, the keys may be moved separately to a voting position, to vote for any desired candidate in any party row. In order to obtain and maintain secrecy, before the voter can cast his ballot he enters the booth and pulls a lever over against the face of the machine which closes a pair of curtains around him, thus preventing anyone from knowing how he votes. In voting, he pulls either a party lever for a straight ticket, or a candidate’s lever to vote independently. As each voter makes his egress, the votes cast are automatically added to the total already recorded by voters that preceded him. Thus, when the polls close only the total vote for each candidate appears, leaving no identifying marks, disclosing how any voter has voted. Each voting machine is in charge of an official, and is equipped with lockout devices which are operated to prevent particular voters from voting for offices or on questions on which they are not entitled to vote. Just back of the rows of keys is located the counter compartment which contains the registering devices for each candidate. The automatic recording feature of the voting machine, as in various other calculating contrivances, assures an immediate compilation of the authentic results as soon as the polls close. This method of securing election returns is in striking contrast with the dilatory procedure involved in ascertaining the true count under the obsolete paper ballots. Eager contestants, political factions, election officers and the press are particularly jubilant over the dispatch with which returns are made available by the machines. The preservation of election returns is another paramount advantage afforded through the use of machines. The retention of the true count is especially valuable in the event of a recount or litigation. There are a number of safeguards embodied in the machine which makes it impossible to alter the returns, or perpetrate election irregularities that are attendant under the old system of balloting. The sanctity of the ballot is greatly appreciated by the American voters and governmental officials. Other noteworthy benefits resulting through the employment of the mechanical ballot are: Easy and speedy voting, an accurate count, reduction of election expenses and the elimination of spoiled and vitiated ballots.